Most Americans don’t know that the Bureau of Prisons has the sole authority to put any prisoner in solitary confinement—or in any prison facility—for any amount of time under any conditions without due process. While 5% of prisoners are in solitary confinement, over 50% of all prison suicides take place there. After a day of total isolation the brain begins to change. After three days the neurological system begins to react and there are changes in vision, in sleep patterns, and in memory. After two weeks there is irreparable harm to the brain function and the emotional centers of the brain. It goes on and on until people scream and wail and self-mutilate and living in a delusional state. In solitary confinement some psychological damage is irreparable to human beings forced to endure these horrendous punishments. Prisoners are spending 10, 20, 30, 40 years in extreme isolation and suffer the accompanying sensory deprivation. This living burial is more than a punishment. It is a form of torture and must be stopped. From the very inception of the American penitentiary, solitary confinement has been in use despite its disastrous human costs. In 1816, the Auburn penitentiary held scores of prisoners in solitary confinement and several dozen of them committed suicide. The state experimented again in Pennsylvania in the 1830’s and the same thing occurred. Each time it was a cause and effect disaster—with prisoners killing themselves. Two hundred years later, the United States has upwards of 80,000 prisoners in long-term solitary confinement—more than all other countries put together. In the 2014 Federal Budget the Federal Bureau of Prisons will receive an additional 6.5 billion dollars to build new prisons across America. Out of that, $43.7 million will go to building 2,100 beds in ADX USP Thomson in Illinois. ADX stands for administrative-maximum, high security facility—read solitary confinement. This will allow the Bureau of Prisons to hold thousands more prisoners in total lockdown and full-time solitary confinement. 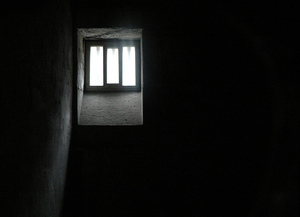 Solitary confinement historically was used as a punishment for infractions within the prison. Losing freedom all by itself was the punishment. This year the Prison Writing Committee has invited Shane Bauer to speak at the PEN World Voices Festival. Shane spent 26 months in Iran’s notorious Evin prison, four of those months in solitary confinement. After a recent tour of solitary confinement blocks in Pelican Bay State Prison, Shane found startling and disturbing similarities between US and Iranian facilities. You can read more about that here. Come hear PEN’s prison panel at this year’s World Voices Festival, and learn more about solitary confinement and other prison conditions, and listen to the men and women whose voices inside these walls PEN works to amplify.